This article was written specifically for marketing teams who are considering offering Google My Business as an additional service for their clients. For reasons why it's beneficial, skip to the challenges and opportunities section. At Sendible, it’s our mission to help marketers be more productive by giving them the opportunity to lift themselves to achieve their greatest potential. 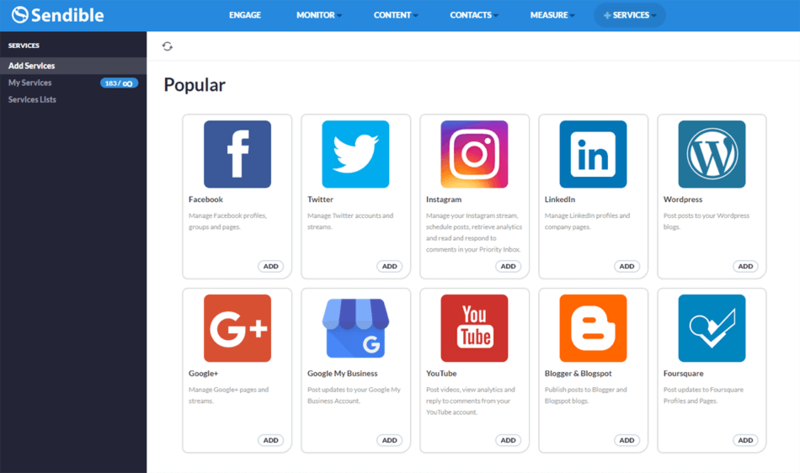 So, when a new platform comes along that gives marketers the ability to attract new customers - naturally, we jump at the opportunity to learn all about it and do our best to get it integrated into the Sendible platform as soon as we can! 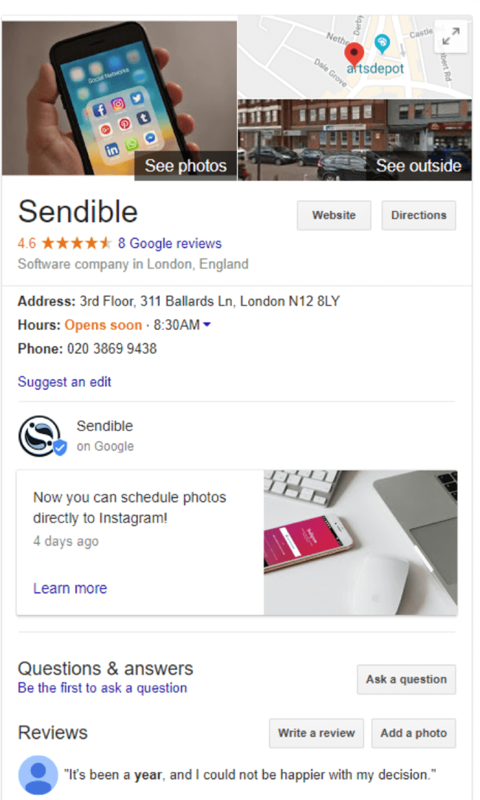 That’s why we’re excited to let you know that we have recently added the ability to schedule posts to Google My Business pages using Sendible. If you haven’t yet heard of Google My Business and why it is essential for your clients to jump on it immediately, read on. 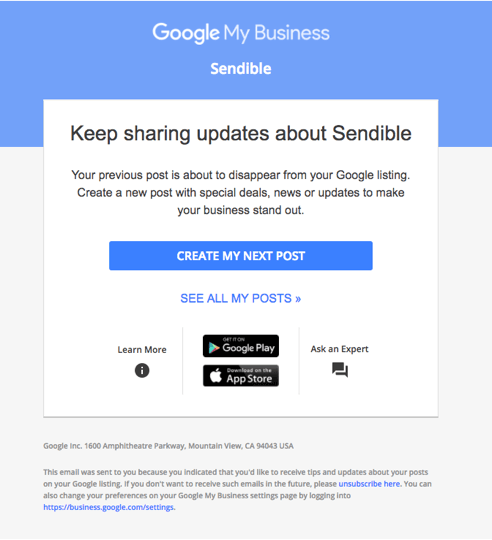 Or - if you’d like to learn how to schedule Google My Business Posts to your Google My Business profile using Sendible, skip ahead. How your client’s brand is being portrayed and discussed across the social web can sometimes feel entirely out of your control. There’s always the worry that potential customers could be misled, either through negative reviews or inaccurate business information nudging prospects towards competitors. Google My Business is a great way to solve the latter issue. In a similar way that Yelp and TripAdvisor allow businesses to be listed with accurate information, Google My Business has the added benefit of being tied to Google’s search engine. When customers search for a business, Google will display a customizable listing alongside the search results. Details such as location, opening hours and reviews are all present within Google’s search results page, giving users a direct line to your client’s business and eliminating any potential barriers to engagement. If you don’t yet have a Google My Business account, you can set one up here. Google has created a really simple setup wizard that’s easy to follow for even the least tech-savvy businesses. One of the most exciting features that have come from the Google My Business team has been the new Posts feature. Google My Business Posts are a feature offered within Google My Business that enables businesses to publish content directly to Google’s search results. Yes, you heard that right! When you publish a Google My Business Post, that post will appear within Google’s search results whenever someone is searching for your business. 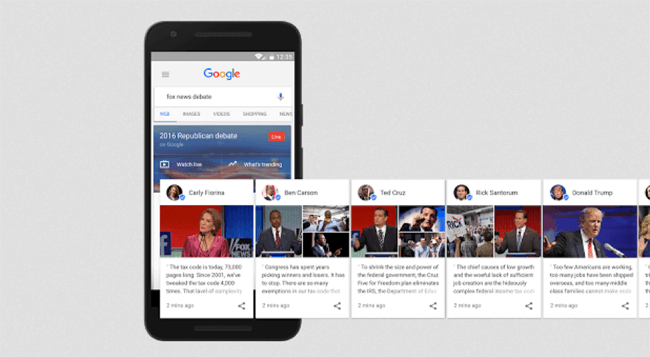 Originally referred to as Google Posts or Candidate Cards, this product was launched by Google as an experimental feature in January 2016 as a way for US presidential candidates to add their own content and messages directly on the search results page. The candidates were able to post up to 14,400 characters of text and 10 images per post. In March 2016, Google Posts were made available for use by a tiny number of small businesses. A year later, in March 2017, Google extended this product to movies, museums, sports teams and leagues in the US and Brazil. Finally, in June 2017, Google built this feature into the Google My Business platform, making it available to all businesses. If you’re looking to attract more web traffic and customers for your clients, then Google My Business Posts are a great way to do that! If you’re running an agency and you don’t currently manage your clients’ Google My Business presence, the new Posts feature is a massive opportunity for you deliver value. Here are four ways your clients can benefit from posting to their Google My Business listings. Feel free to copy these into your pitch deck! Promote events and tell customers about upcoming happenings at your store. 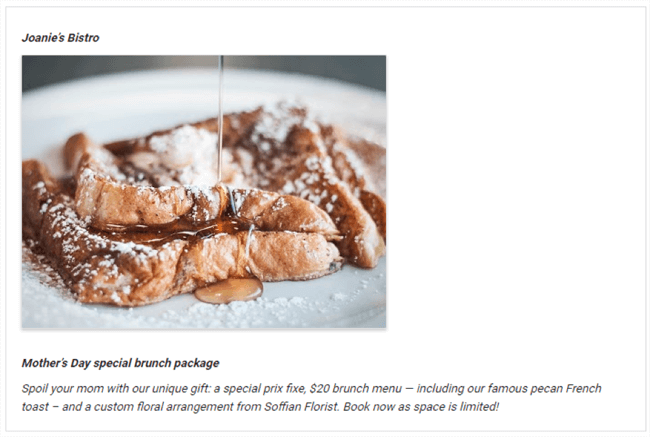 Choose one of the available call-to-actions to help you connect with customers directly from a Google Post: give them a one-click path to make a reservation, sign up for a newsletter, learn more about latest offers, or even buy a specific product from your client’s website. Make this post an event (with start and end dates). Add a button with predefined call-to-action labels, including “Book”, “Order online”, “Buy”, “Learn more”, “Sign up”, or “Get offer”. Posts will show up in both Google Search and Maps results, but be aware that posts will expire within seven days of posting them. The only exception to this rule is if your posts are based on upcoming events. Event-based posts are removed on the date of the event. Once your post has expired, you’ll receive a notification letting you know just how much attention your post has received and prompting you to post your next one. For more information on Google My Business Posts, take a look at the Google My Business Help center. If your clients have a physical address and you are not yet posting to Google My Business, you may be doing them a disservice and they may be losing out on potential customers. As an agency, it’s your duty to make sure you’re delivering results for your clients, and Google My Business Posts presents you with a great opportunity to do that by driving customers through your clients’ doors. To truly understand the benefits, you need to put yourself in a customer’s shoes. Let’s take a local restaurant for example. It’s Sunday night and you run a happy hour from 6 pm - 7 pm that’s only visible on your Facebook Page and on your website. A potential patron is looking up your address and reviews to compare you to a very similar restaurant in the same neighborhood. Luckily, you have been publishing a weekly Google My Business Post to your listing about your happy hour. Now, when this patron looks you up on Google or on Google Maps and compares you to competitors, immediately they see that you run a happy hour every Sunday and they decide to come to your establishment over the competitor. Besides attracting potential customers, Google My Business Posts can also have a positive impact on search rankings. According to a case study carried out by Search Engine Land in November 2017, they showed that Google My Business Posts can have a slight impact on search engine rankings. They also showed that the search rankings maintained themselves for weeks after posting stopped. This is contrary to what has been previously observed with Google+ posts. You can help your clients get more customers in the door by using Google My Business Posts and we explore how in the webinar we recently hosted (you can watch the recording below). This is all well and good, but as an agency, how can you publish Google My Business Posts for your clients at scale? Also, since we know that Google My Business Posts expire within seven days, managing and timing posts for your clients in this way can be a nightmare! Your agency needs a reliable tool to help you and your team easily oversee and schedule updates to your clients’ Google My Business listings. That’s where Sendible’s new Google My Business scheduling tools come in handy! 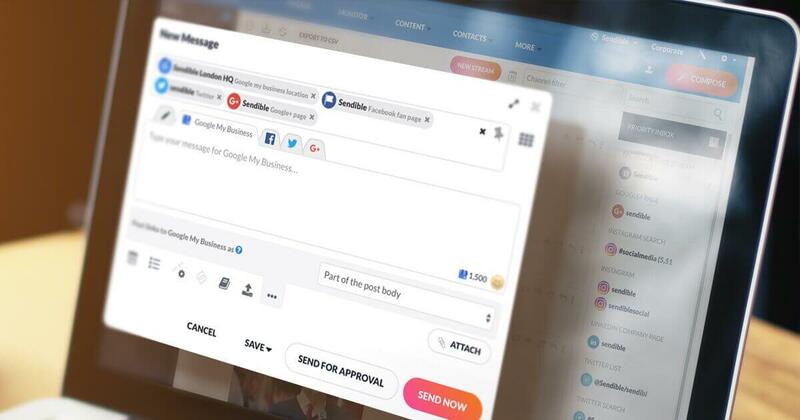 To connect your first Google My Business account to Sendible, sign in and go to +Services. You’ll notice the Google My Business icon available within the Popular category. Follow the steps to connect your Google My Business account. You’ll be prompted to grant Sendible with the following permission, click Allow to continue. Select your Google My Business account followed by the location you wish to manage, then click Save Settings. If you’d like to connect another location, simply repeat the above steps until you’ve connected each location to Sendible. 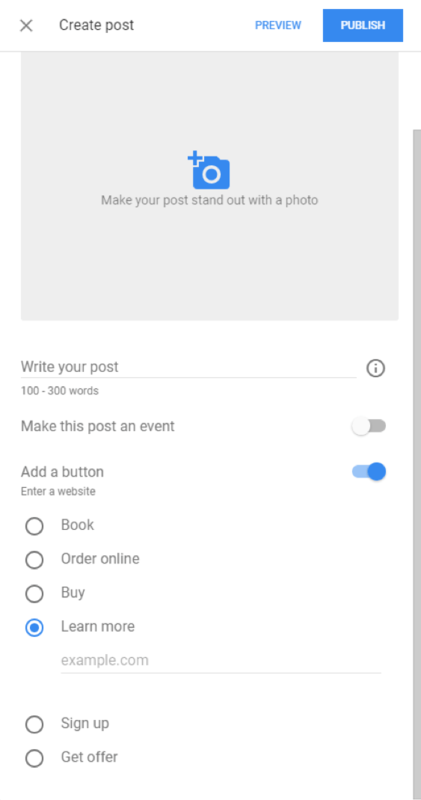 Now that you’ve connected your Google My Business accounts, you can go ahead and schedule your first post. To do this, simply launch the Compose Box and select one or more of your Google My Business locations to post to. When you select a Google My Business location to post to, you’ll notice that an option appears below your post allowing you to select the CTA you’d like to use. 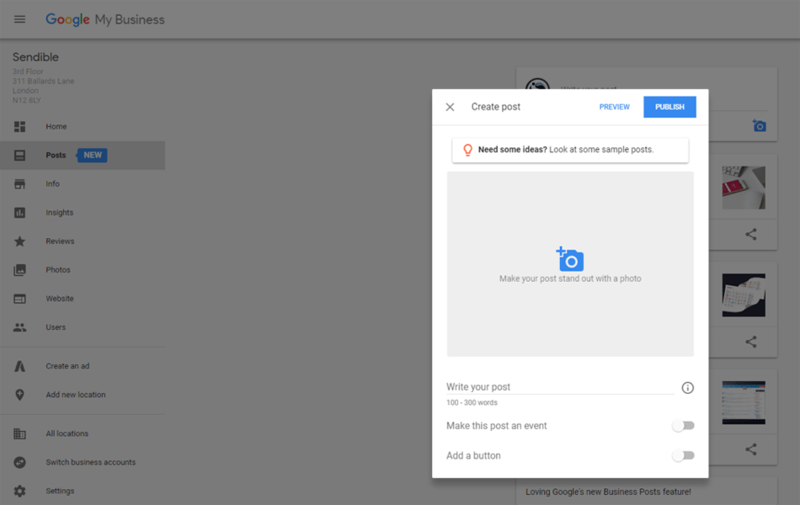 If your post includes a link, this option allows you to automatically create a button on your Google My Business Post when it gets published, directing visitors to your link. If you’ve included a link in the body and would prefer to post a full-sized image to Google My Business, simply, click “Replace Link Preview with Image” and you’ll be able to swap your link preview for a full-sized image of your choice when posting. How Do I Add a Google My Business Service? Google has provided a few more examples of well-crafted Google My Business Posts. For more inspiration, I urge you to take a look at their help center to see what other good Posts look like. Select a suitable post type: Is your post about an event? An offer or time-sensitive deal? Do you have news to share? Consider what you want your post to do — whether to encourage customers to visit your store, sell something, or announce a new feature. Take good photos: Take a high-resolution photo reinforcing your message so your post will stand out. Photos should be: Simple, direct, and in-focus. Well-lit, with bright, vibrant colors. At a minimum resolution of 720px wide by 540px tall, in JPG or PNG format. Use a title that inspires action: Describe your event in 4-5 words. You have 58 characters for your title. Keep your copy clear and concise: Be clear about the offer/event. You have up to 1,500 characters for the details of your post, but the ideal length is between 150-300 characters. Use a call-to-action: Include instructions such as “Buy,” “Book online,” “Learn more,” “Call,” or “Visit." Be sure to include any redemption instructions, unique codes, or restrictions on offers or sales. "$10 off purchase of $50 or more. 50% off select women’s clothing." Note: All existing Google My Business content policies, review policies and photo guidelines apply to Posts as well. If you run an agency and you are not yet posting to Google My Business, I urge you to start offering this service to your clients as soon as possible. Not only will you be able to help your clients drive more customers through the door, but with this being such a new and somewhat unknown feature, you’ll be getting in early, ahead of competitors. Google My Business Posts have been surprisingly underutilized by businesses and agencies, mainly due to the fact that it was previously impossible to schedule posts. With the recent feature addition to create and update posts via the Google My Business API, this is an opportunity for people to start using Google My Business Posts more. 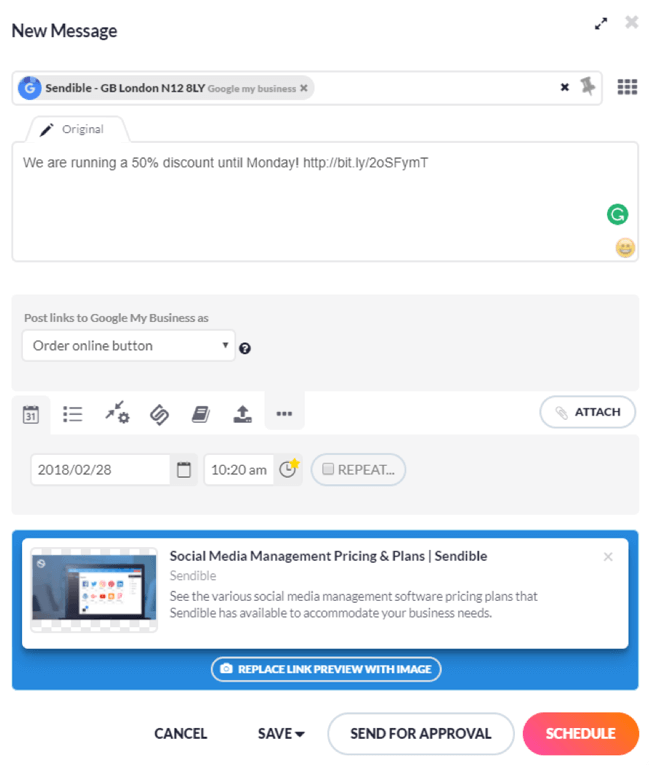 Sendible’s integration with Google My Business makes it extremely easy for agencies to schedule, publish and oversee Google My Business Posts for multiple clients at once. If you’re already a Sendible customer, this feature is now available on all plans. 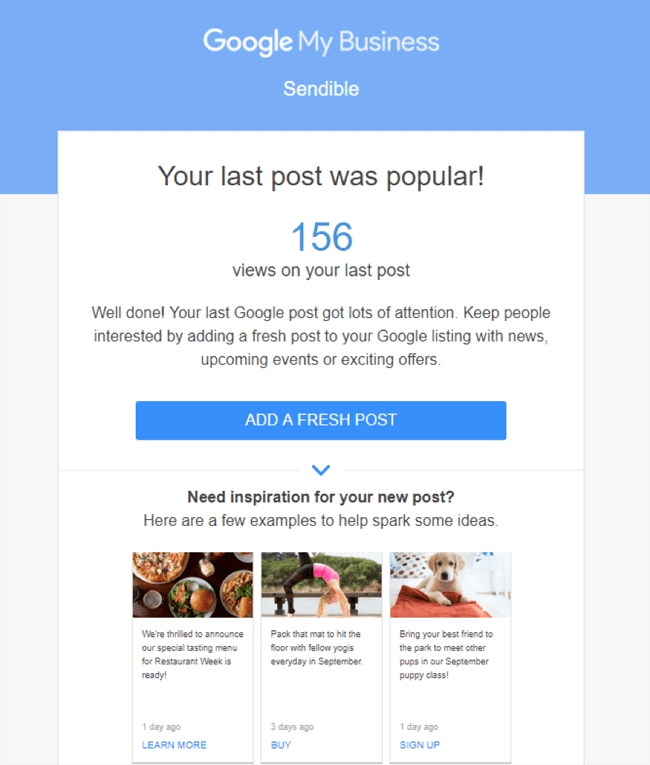 If you’re new to Sendible, simply start a free 30-day trial today. Tech entrepreneur, software developer and founder of Sendible.com.